A picture of the fire in the playground was posted on Twitter by local officers. 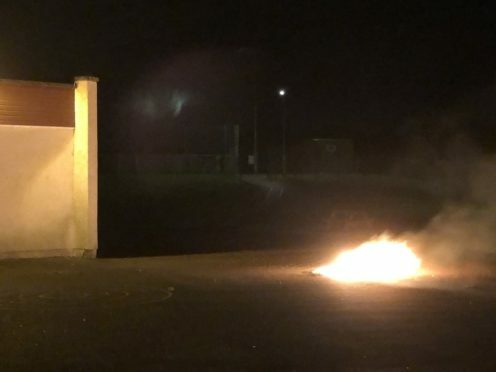 A group of youths who hurled abuse at emergency services called to deal with a deliberate fire at a Fife primary school over the weekend have been widely condemned. Members of the community in the village of High Valleyfield have been angered by reports following an incident in the playground of St Serf’s RC Primary School on Saturday evening. Firefighters were called to tackle the small wheelie bin fire at around 7.50pm. Police were also summoned and personnel from both services were subjected to verbal abuse as they went about their job. Two people – thought to be part of the group causing the disturbance – have been charged with police assault and breach of the peace, and the unsavoury incident has been described as “not acceptable” by local officers on social media. A Police Scotland spokesperson confirmed two people have been reported to the procurator fiscal and urged anyone with further information to come forward. “Police in Fife are investigating following a wilful fireraising at St Serf’s RC Primary School, High Valleyfield,” the spokesperson added. “Police and the Scottish Fire and Rescue Service attended and the blaze was quickly extinguished. “Inquiries into the full circumstances are ongoing. A spokesperson for the Scottish Fire and Rescue Service confirmed that one crew from Dunfermline was called out to a report of a fire at St Serf’s RC Primary School in Preston Street and quickly brought the fire under control. Local SNP councillor Kate Stewart, who represents the West Fife and Coastal Villages ward, was disappointed to hear about the turn of events on Saturday evening in High Valleyfield. “They are risking their own lives as well as others, and these acts are completely out of order,” she commented. “To be honest, I don’t think they really realise the seriousness of what could happen. Mrs Stewart added members of the Valleyfield Heritage Project have previously had to deal with wilful fire-raising in the last few years which caused damage to a local mural, but suggested it had not been a common problem in the village.